Sri Lanka has been known by many names over the centuries. During the years under the British occupation is was known as Ceylon and many years before that it was called Serendib, a word now used to describe utter tranquility and relaxation. It is said that Marco Polo visited this tear shaped Island in the 14th century and described it as " undoubtedly the finest island in the world ". Located close to the Southern tip of the Island of Sri Lanka and only about 200 km from the Equator, this secluded crescent shaped beach is the perfect place to sit back, relax and forget about all the hussle and bussle of your other life that’s a million miles away. This small sandy tropical beach boasts some of Sri Lanka’s best and most stunning sunsets and sunrises. All the Guest Houses in Mirissa are set back from the actual beach giving you the impression that you are on a deserted palm fringed island. Every now and again the silence is broken by the sound of a coconut falling on the sand or a chilled beer being opened by someone further up the beach. 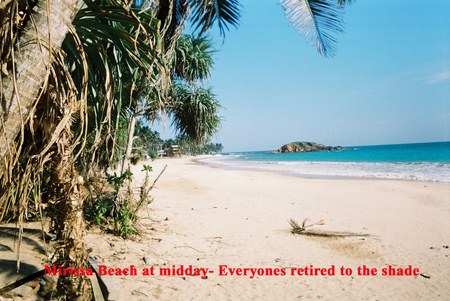 You are not the only person who is interested in visiting Mirissa Beach in Sri Lanka.